The 30-year fixed mortgage rate on Zillow Mortgages is currently 3.88 percent, unchanged from this time last week. 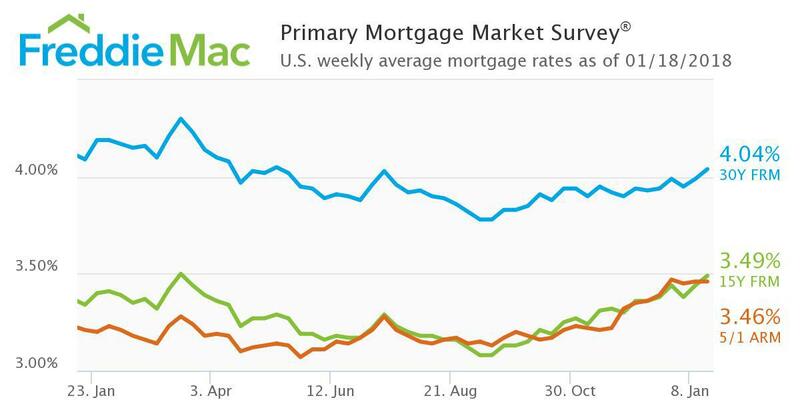 The 30-year fixed mortgage rate hovered around the current rate for the past week. The rate for a 15-year fixed home loan is currently 3.32 percent, and the rate for a 5-1 adjustable-rate mortgage (ARM) is 3.40 percent. The rate for a jumbo 30-year fixed loan is 4.03 percent. “Mortgage rates were mostly flat this holiday-shortened week, stabilizing after rising to their highest levels since July earlier this month,” said Aaron Terrazas, senior economist at Zillow. “Monetary policy decisions, incoming economic data and geopolitical news dominated headlines over the past few years, but markets are paying increasing attention to the fiscal outlook. 30-year fixed-rate mortgage (FRM) averaged 4.04 percent with an average 0.6 point for the week ending January 18, 2018, up from last week when it averaged 3.99 percent. A year ago at this time, the 30-year FRM averaged 4.09 percent. 15-year FRM this week averaged 3.49 percent with an average 0.5 point, up from last week when it averaged 3.44 percent. A year ago at this time, the 15-year FRM averaged 3.34 percent. 5-year Treasury-indexed hybrid adjustable-rate mortgage (ARM) averaged 3.46 percent this week with an average 0.3 point, unchanged from last week. A year ago at this time, the 5-year ARM averaged 3.21 percent. 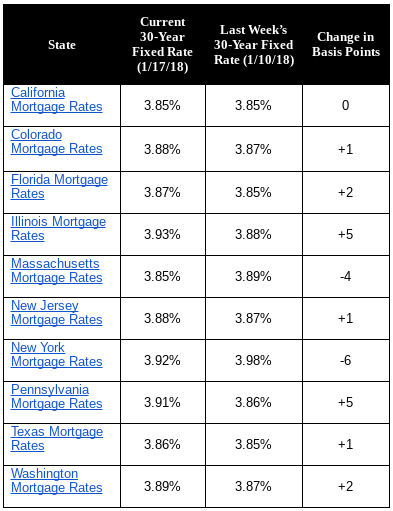 Len Kiefer, deputy chief economist at Freddie Mac, said: “The U.S. weekly average for the 30-year fixed mortgage rate rose above 4 percent for the first time since last summer to 4.04 percent in this week’s survey. This is the highest weekly average for the 30-year fixed rate mortgage since May of 2017. Privately-owned housing units authorized by building permits in December were at a seasonally adjusted annual rate of 1,302,000. This is 0.1 percent (±1.4 percent)* below the revised November rate of 1,303,000, but is 2.8 percent (±1.9 percent) above the December 2016 rate of 1,266,000. Single-family authorizations in December were at a rate of 881,000; this is 1.8 percent (±1.2 percent) above the revised November figure of 865,000. Authorizations of units in buildings with five units or more were at a rate of 382,000 in December. An estimated 1,263,400 housing units were authorized by building permits in 2017. This is 4.7 percent (±0.6%) above the 2016 figure of 1,206,600. Privately-owned housing starts in December were at a seasonally adjusted annual rate of 1,192,000. This is 8.2 percent (±7.7 percent) below the revised November estimate of 1,299,000 and is 6.0 percent (±11.7 percent)* below the December 2016 rate of 1,268,000. Single-family housing starts in December were at a rate of 836,000; this is 11.8 percent (±6.5 percent) below the revised November figure of 948,000. The December rate for units in buildings with five units or more was 352,000. An estimated 1,202,100 housing units were started in 2017. This is 2.4 percent (±2.3%) above the 2016 figure of 1,173,800. Privately-owned housing completions in December were at a seasonally adjusted annual rate of 1,177,000. This is 2.2 percent (±17.8 percent)* above the revised November estimate of 1,152,000 and is 7.4 percent (±13.0 percent)* above the December 2016 rate of 1,096,000. Single-family housing completions in December were at a rate of 818,000; this is 4.3 percent (±20.5 percent)* above the revised November rate of 784,000. The December rate for units in buildings with five units or more was 346,000. An estimated 1,152,300 housing units were completed in 2017. This is 8.7 percent (±3.1%) above the 2016 figure of 1,059,700. The Market Composite Index, a measure of mortgage loan application volume, increased 4.1 percent on a seasonally adjusted basis from one week earlier. On an unadjusted basis, the Index increased 32 percent compared with the previous week. The Refinance Index increased 4 percent from the previous week. The seasonally adjusted Purchase Index increased 3 percent from one week earlier. The unadjusted Purchase Index increased 35 percent compared with the previous week and was 7 percent higher than the same week one year ago. The refinance share of mortgage activity decreased to 52.2 percent of total applications from 52.9 percent the previous week. The adjustable-rate mortgage (ARM) share of activity increased to 5.2 percent of total applications. The FHA share of total applications increased to 11.7 percent from 11.1 percent the week prior. The VA share of total applications decreased to 10.7 percent from 11.4 percent the week prior. The USDA share of total applications increased to 0.8 percent from 0.7 percent the week prior. The average contract interest rate for 30-year fixed-rate mortgages with conforming loan balances ($453,100 or less) increased to its highest level since March 2017, 4.33 percent, from 4.23 percent, with points increasing to 0.54 from 0.35 (including the origination fee) for 80 percent loan-to-value ratio (LTV) loans. The effective rate increased from last week. The average contract interest rate for 30-year fixed-rate mortgages with jumbo loan balances (greater than $453,100) increased to its highest level since March 2017, 4.25 percent, from 4.16 percent, with points increasing to 0.36 from 0.23 (including the origination fee) for 80 percent LTV loans. The effective rate increased from last week. The average contract interest rate for 30-year fixed-rate mortgages backed by the FHA increased to its highest level since March 2017, 4.30 percent, from 4.16 percent, with points increasing to 0.65 from 0.42 (including the origination fee) for 80 percent LTV loans. The effective rate increased from last week. The average contract interest rate for 15-year fixed-rate mortgages increased to its highest level since January 2014, 3.77 percent, from 3.66 percent, with points increasing to 0.44 from 0.42 (including the origination fee) for 80 percent LTV loans. The effective rate increased from last week. The average contract interest rate for 5/1 ARMs increased to its highest level since April 2011, 3.62 percent, from 3.50 percent, with points decreasing to 0.48 from 0.51 (including the origination fee) for 80 percent LTV loans. The effective rate increased from last week. The median home price rose 8.1 percent year-over-year, with 50 of the report’s 54 markets posting increases. At the same time, December sales dropped 3.3 percent from December 2016, with 39 markets reporting fewer transactions. Making sales harder was a Months Supply of Inventory of 3.7 which is the lowest December figure in the nine-year history of the report. That corresponds with a 14.6 percent decline in inventory, lengthening a streak of monthly declines that began in November 2008. Homebuyers paid record prices in 2017, led by June’s Median Price Sold of $245,000. Prices increased year-over-year in every month of 2017, with December marking the 21st consecutive month of year-over-year price increases dating back to April 2016. Of the 54 metro areas surveyed in December 2017, the overall average number of home sales decreased 2.5 percent compared to November 2017 and decreased 3.3 percent compared to December 2016. Fifteen of the 54 metro areas experienced an increase in sales year-over-year including, Trenton, NJ, +13.9 percent, Richmond, VA, +10.9 percent, Burlington, VT, +8.1 percent, and Raleigh-Durham, NC, +5.4 percent. In December 2017, the median of all 54 metro Median Sales Prices was $232,500, up 3.1 percent from November 2017 and up 8.1 percent from December 2016. Only four metro areas saw a year-over-year decrease in Median Sales Price; Anchorage, AK, -6.5 percent, Wichita, KS, -3.9 percent, Fargo, ND, -1.8 percent and Wilmington/Dover, DE, -.90 percent. Ten metro areas increased year-over-year by double-digit percentages, with the largest increases seen in San Francisco, CA, +17.8 percent, Las Vegas, NV, +17.1 percent, Seattle, WA, +13 percent and Boise, ID, +12.8 percent. The average Days on Market for homes sold in December 2017 was 57, up three days from the average in November 2017, and down five days from the December 2016 average. The four metro areas with the lowest Days on Market were Omaha, NE and San Francisco, CA, at 27, Nashville, TN, at 31 and Seattle, WA, at 34. The highest Days on Market averages were in Augusta, ME, at 122 and Chicago, IL, and Miami, FL, at 86. The number of homes for sale in December 2017 was down 14 percent from November 2017, and down 14.6 percent from December 2016. Based on the rate of home sales in December, the Months Supply of Inventory increased to 3.7 from November 2017 at 3.6, but decreased compared to December 2016 at 4.2. A 6.0-months supply indicates a market balanced equally between buyers and sellers. In December 2017, 52 of the 54 metro areas surveyed reported a months supply at or less than 6.0, which is typically considered a seller’s market. The metro areas that saw a months supply above 6.0, which is typically considered a buyer’s market, were Augusta, ME, at 9.5 and Miami, FL, at 8.7. The markets with the lowest Months Supply of Inventory continued to be in the west with San Francisco, CA, at 0.9, Seattle, WA, at 1.4, and Denver, CO, 1.5. The 30 days or more delinquency rate for October 2016 was 5.2 percent. In October 2017, 5.1 percent of mortgages were delinquent by at least 30 days or more including those in foreclosure. This represents a 0.1 percentage point decline in the overall delinquency rate compared with October 2016. As of October 2017, the foreclosure inventory rate was 0.6 percent down from 0.6 percent in October 2016. The share of mortgages that transitioned from current to 30-days past due was 1.1 percent in October 2017, up from 1 percent in October 2016. 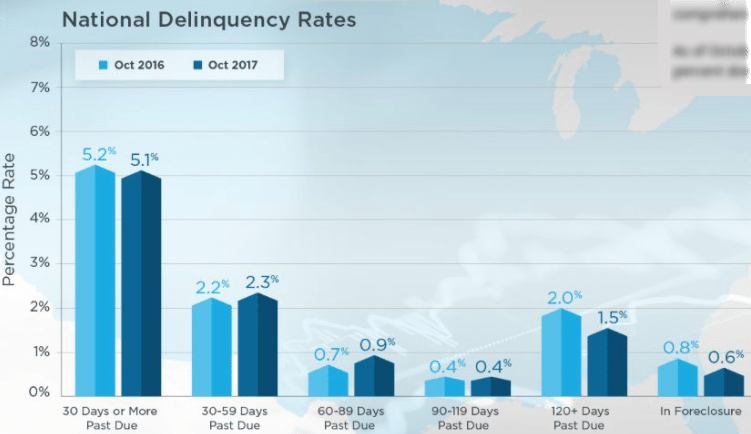 “After rising in September, early-stage delinquencies declined by 0.1 percentage points month over month in October,” said Frank Nothaft, chief economist at CoreLogic. “The temporary rise in September’s early-stage delinquencies reflected the impact of the hurricanes in Texas, Florida and Puerto Rico, but now the impact from the hurricanes is fading from a national perspective.